THE UNITED PIPE CLUBS OF AMERICA (UPCA) WILL HOLD ITS EIGHTH ANNUAL MEETING AT 3:30 PM ON FRIDAY, APRIL 30, AT THE CHICAGO SHOW. THE MEETING ROOM WILL BE POSTED AT PHEASANT RUN RESORT. The agenda for the meeting is set out below. The names of candidates for the election of officers should be sent to the Nominating Committee: Pete Prygelski (petepry@bellsouth.net) and Bruce Podolski (info@greatnorthernpipeclub.org). Please also let us know if you have questions, comments or suggestions for additional Agenda items. The Treasurer’s report will be distributed before the meeting. Minutes of the 2009 meeting are available under “Annual Meetings” on the website. It is important that all UPCA Member Clubs be represented at the Meeting by one or more of their members in order to constitute a quorum and to reflect all views. All other interested persons and organizations, including in particular those forming new clubs, are invited to attend to learn more about UPCA and its activities. This is an opportunity to meet pipe smokers from many different clubs, to exchange information and to pick up ideas for your own group. The Annual Meeting permits you to participate directly in a review of UPCA’s purposes and activities – and to help chart its future course. NOTE that there will be a presentation on the new UPCA website and how to use it to your benefit. 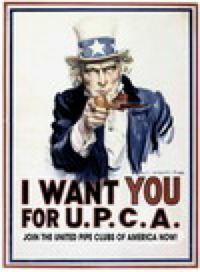 Please come with your suggestions regarding UPCA’s role and how it might provide greate value to its Members and to the broader American pipe smoking community. Presentation by Cam Schutte on the new improved UPCA website: How to use it and obtain maximum benefit.